Comments The beauty of Selene, the charm of Luna, the powers of Chandra soft and enchanting – all converge in the ever so pleasing moonstone featured today. 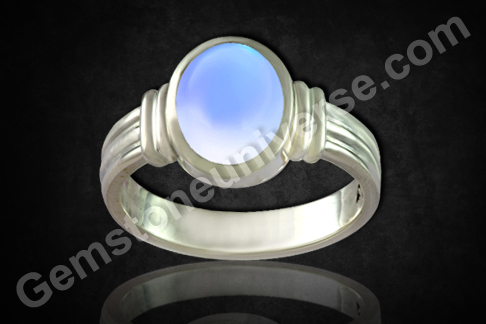 The natural Blue Moonstone from India weighing 5.18 carats has been set in a sterling silver as a men’s ring. India has been known for producing some really fine Blue moonstone which is a powerful substitute gem for Natural pearl. The softness of the blue moonstone in appearance and the blue sheen are typically its attracting attributes. The visibility of blue sheen across the gem as the light moves across it, known as the phenomeon of adularescence, that was coined after Mount Adular, in Switzerland, after some valuable reserves were found at the foot of this mountain. The Blue moon stone is a gem of the feldspar group. The Blue moonstone in astrology is well known for harnessing the lunar energies too and has been a popular gemstone in India. Pliny, the elder, the famed Roman author had an astrion, which is widely believed to have been a Moonstone. 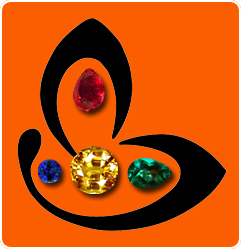 It is said to have shone with a star like bright appearance (Moonstones can exhibit asterism). In Hindi, the Blue moonstone is also known as chandrakant, meaning that which has the aura of moon.